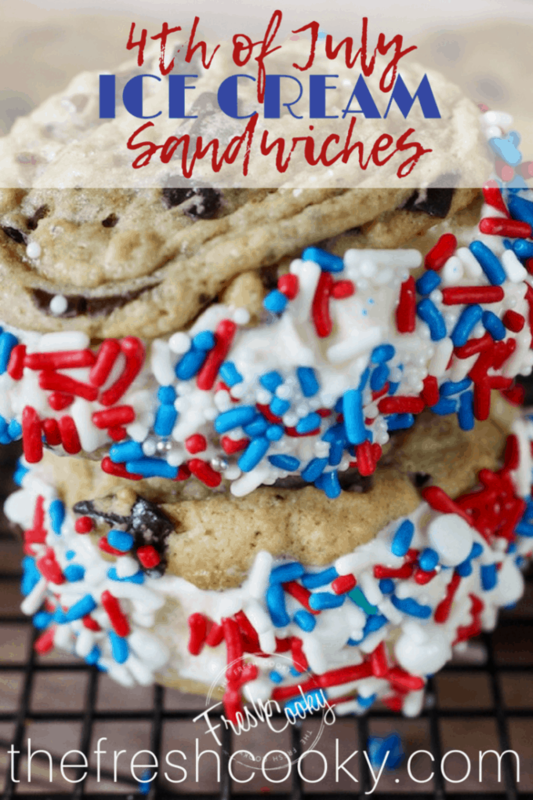 Creamy, cool ice cream, sandwiched between two delicious, chewy Chocolate Chip Cookies, dipped in sprinkles no less — the very essence of summertime! 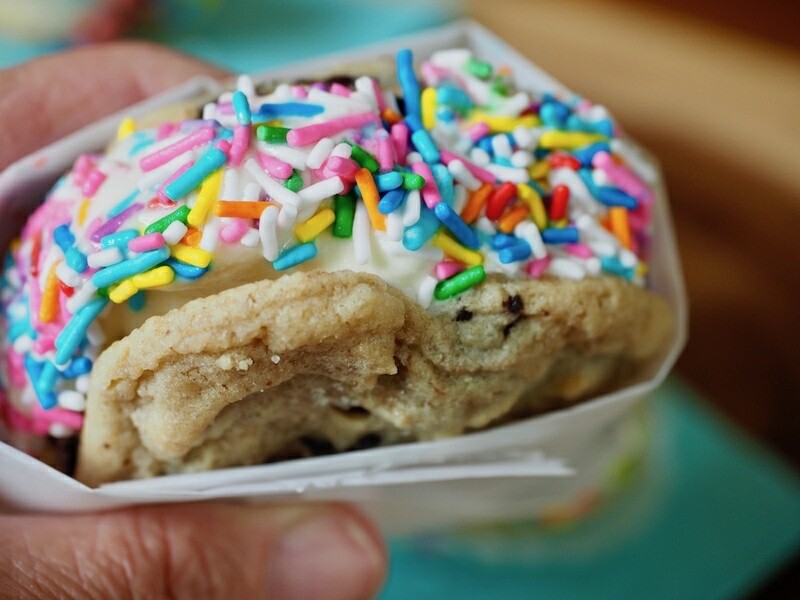 Anyone can make these festive Chocolate Chip Cookie Ice Cream Sandwiches. These are perfect for the 4th of July! I LOVE, LOVE, LOVE the 4th! 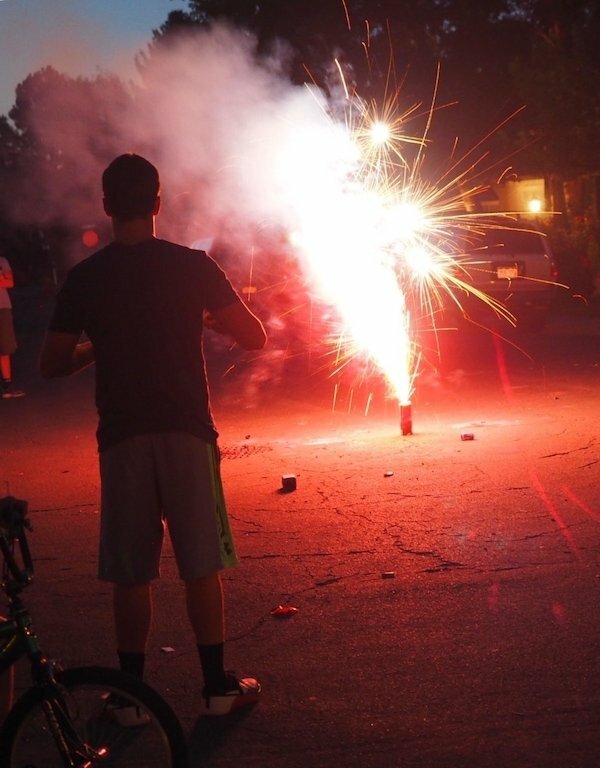 Our neighborhood is kind of renowned for it’s 4th of July celebration. We start the day with our National Anthem, usually sung by a group of neighborhood kids, it’s fantastic. That blasts off the festivities for the day; Fun Run, Sparkler Tricycle Race, finishing the morning with our very own home-town parade, it’s pretty amazing. Then all of the neighbors are invited up to the pool for a monster BBQ; with lawn games, a band, float races, penny dive and of course a belly flop contest. We’re usually so exhausted from our fun-filled, patriotic, sun-kissed day that we drag ousrelves home, take a cool shower, watch [amazon_textlink asin=’B01D1JDHIS’ text=’Independence Day’ template=’ProductLink’ store=’thefreshcoo0a-20′ marketplace=’US’ link_id=’2e37f798-7a67-11e8-810d-ad8859c907d3′], eat a little something that we scrounge from the fridge and then head over to our friends house for fireworks and drinks. It’s fantabulous…I don’t take our freedoms for granted! They will cool down the hottest patriotic participant! Change it up depending on your holiday…use [amazon_textlink asin=’B0018AMWES’ text=’green sprinkles’ template=’ProductLink’ store=’thefreshcoo0a-20′ marketplace=’US’ link_id=’27f2d784-7890-11e8-88a3-41b6bd580fd0′] for St Patrick’s day, [amazon_textlink asin=’B00AV4YS0I’ text=’Red Heart Sprinkles’ template=’ProductLink’ store=’thefreshcoo0a-20′ marketplace=’US’ link_id=’476b2d0f-7890-11e8-ac8d-6102938004ab’] for Valentine’s Day…you get the idea! May God bless America! And I don’t say that flippantly or casually! 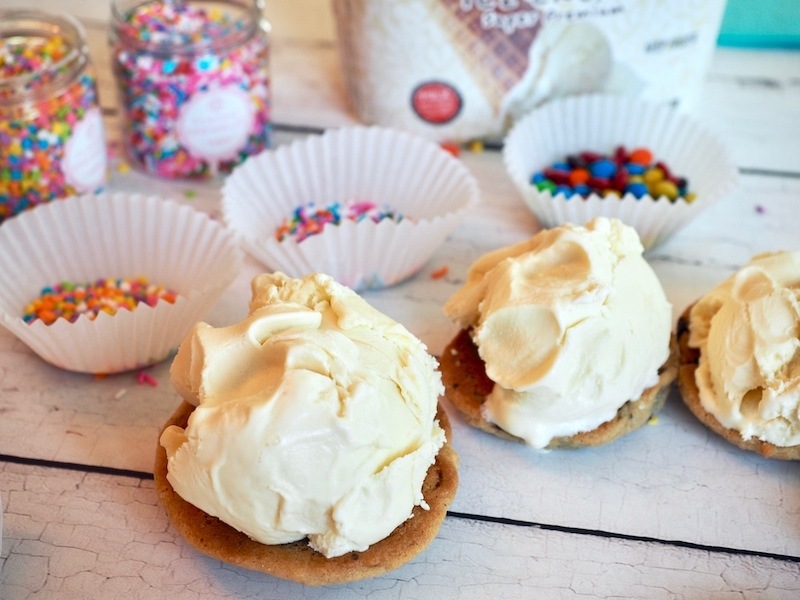 Here are my tips to assuring you make the chewiest-yummiest-cutest Ice Cream Sandwiches! 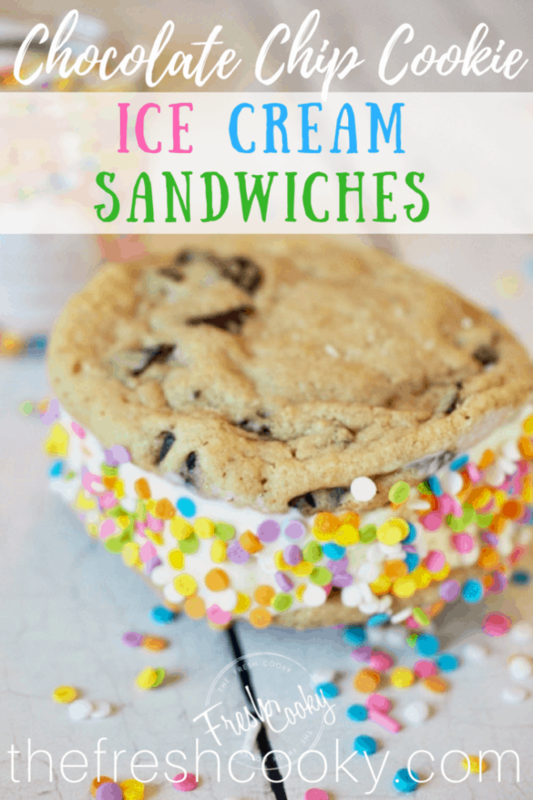 Any chocolate chip cookie ice cream sandwich worth it’s salt (yes, I put [amazon_textlink asin=’B00GCDFRYS’ text=’salt’ template=’ProductLink’ store=’thefreshcoo0a-20′ marketplace=’US’ link_id=’3f819897-7804-11e8-af5e-bff04fc85bea’] on my cookies) starts with the BEST and CHEWIEST Chocolate Chip Cookie! You can use a store bought cookie…but why would you??? I won’t judge! FREEZE YOUR COOKIES | Once your chocolate chip cookies have cooled completely, pop those babies (i.e. cookies, in case you are taking me literally) into the freezer until they are frozen, about 20 minutes. Why, you ask? You don’t want your cookies to turn into crumbs or mush when you press the two cookies together sandwiching the ice cream; freezing them provides structure and hardens the chocolate. SOFTEN your ice cream by allowing it to sit on the counter* for about 10 minutes, making sure your cookies will be nice and frozen by the time the ice-cream is soft. *If you are in a hurry, you may zap it in the microwave in 10-15 second intervals, checking after each interval, until it’s just soft enough to scoop, you don’t want it soupy! ICE CREAM! Make sure it’s the highest quality, creamiest ice cream you can easily buy (which might mean going to your local grocery store and buying what’s on sale!). For me that means either Häagen-Dazs® Vanilla Bean or Trader Joe’s® French Vanilla, or make homemade vanilla bean ice cream (recipe coming soon) and you’ll hit it out of the park! Choose your flavor, but vanilla is certainly the most traditional! 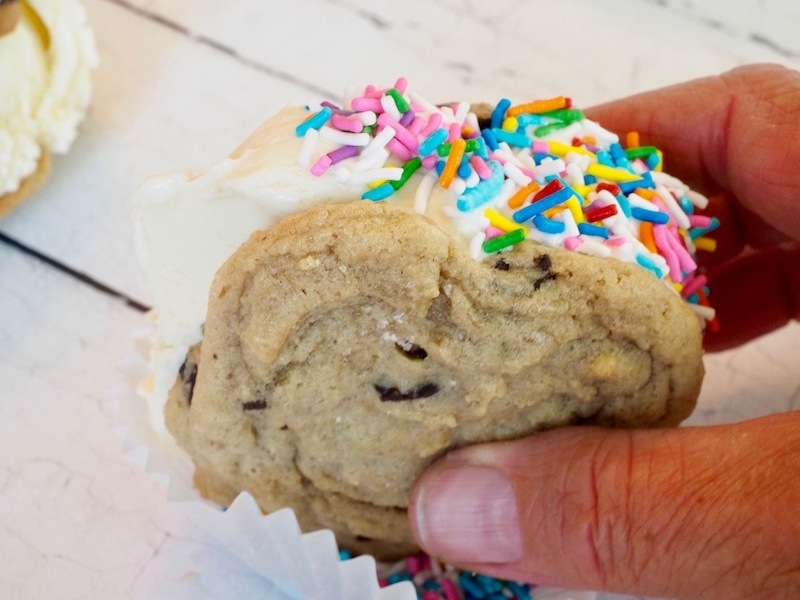 ASSEMBLE | Place a generous scoop of ice cream on the bottom of your cookie, match it up with a similarly sized cookie and gently roll ice cream edges in sprinkles. Set on cookie sheet and repeat process. Be quick about it! FREEZE | If doing more than 4 at a time, take them to the freezer in batches of 4 so they don’t melt. Freeze for 20 minutes and then wrap tightly in plastic wrap for easy serving and storing. That’s it! 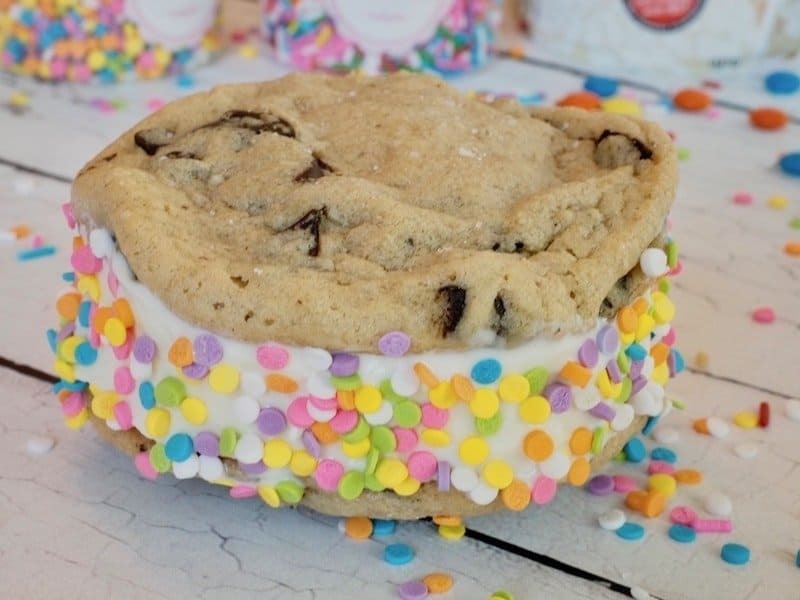 You will brighten anyones day by offering them a cool, creamy ice cream sandwich with sprinkles no less! In case you haven’t noticed, sprinkles are kind of a big deal now, two fo my favorites are Texan Sprinkles as well as Sweetapolita, you’ll be hooked. There are so many [amazon_textlink asin=’B07B46PSMW’ text=’sprinkle’ template=’ProductLink’ store=’thefreshcoo0a-20′ marketplace=’US’ link_id=’f8d15d3f-7805-11e8-95e0-8dd01fa8a8e4′] options out there! I found that [amazon_textlink asin=’B00375LBNA’ text=’Jimmies’ template=’ProductLink’ store=’thefreshcoo0a-20′ marketplace=’US’ link_id=’8eaf41bf-7805-11e8-8d84-f951ccf86706′] & [amazon_textlink asin=’B008Y2TST0′ text=’Confetti sprinkles’ template=’ProductLink’ store=’thefreshcoo0a-20′ marketplace=’US’ link_id=’9b201227-7805-11e8-af59-5f58e9f0635a’] work really well, as do any [amazon_textlink asin=’B003VSEON2′ text=’edible confetti’ template=’ProductLink’ store=’thefreshcoo0a-20′ marketplace=’US’ link_id=’adf5b218-7805-11e8-a964-c72975b444ba’], mini chocolate chips work fantastic too. I tried Mini M & M’s which tasted great, but the colors ran all over the ice cream, next time I might try freezing them before I roll them. Want to kick them up one more notch?? To make these extra decadent, dip one half in melted chocolate (follow the instructions on your package of [amazon_textlink asin=’B00H3T7BCQ’ text=’Ghirardelli Dark Chocolate Melting Wafers’ template=’ProductLink’ store=’thefreshcoo0a-20′ marketplace=’US’ link_id=’70bfcc13-7a20-11e8-8d24-d5d0026283fa’] or Chocolate Chips), then sprinkle on your favorite sprinkles! Told ya I kicked it up a notch, but YOU, your family and friends are worth it! Serve immediately or return to the freezer (wrapped once solid) until ready to eat. Grab a fork and share…or not! 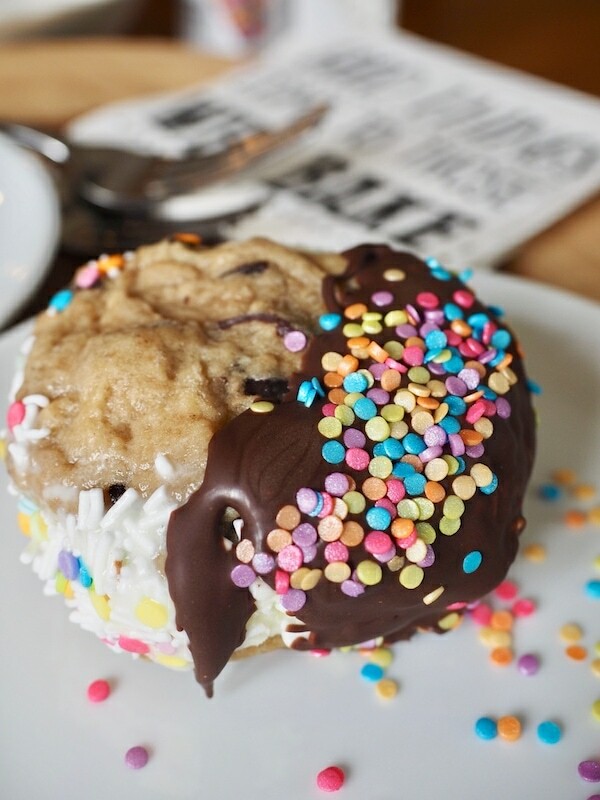 Creamy ice cream sandwiched between two amazing chocolate chip cookies, rolled in brightly covered sprinkles! The essence of summer in a handheld treat. Cream softened butter in mixer, 1-2 minutes, until light and fluffy, scrape down edges of bowl. Add both granulated and brown sugar and cream well, beat on medium-high for 2-4 minutes, scraping down sides about half way between. (About 4 minutes if using natural cane sugar). Add eggs, one at a time, cream on medium-high 1 minute for each egg addition, scrape down sides in between. Add vanilla and mix well. With mixer on low/stir, slowly add in ½ cup of flour mixture at a time and gently mix, add water in between flour additions, don’t over mix. 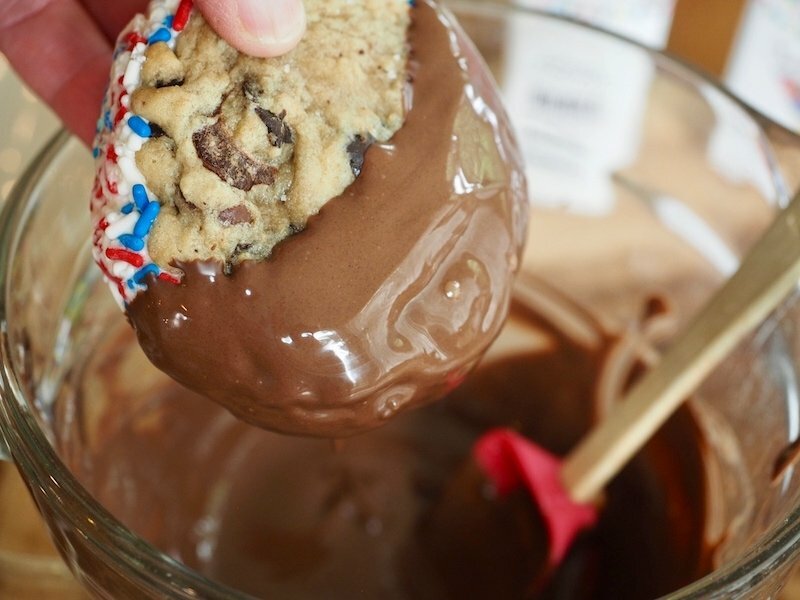 Once mixed well, scrape sides of bowl and pour in chocolate chips, minis and chunks, stir (with low on mixer or by hand) on low, until combined. Scoop into dough balls using a 2-tablespoon scoop onto a parchment lined cookie sheet, 2 inches apart. Place in fridge 10 minutes prior to baking, bake 8-10 minutes until just set and slightly golden. I recommend that you only make 18 cookies for ice cream sandwiches, yielding 9 sandwiches. If you choose to make all 18 you will probably need more ice-cream and sprinkles. Follow the Dough Freezing instructions on my Chocolate Chip Cookie recipe for making cookies later or just make them all at once and enjoy cookies and sandwiches, but keeping both frozen until ready to eat. Tips to assuring you achieve the chewiest-yummiest-cutest ice cream sandwiches! 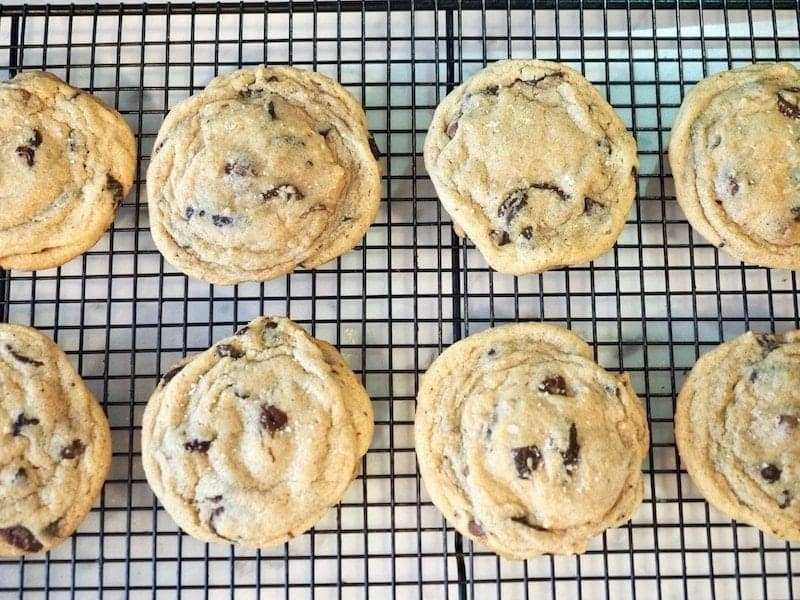 FREEZE YOUR COOKIES | Once your chocolate chip cookies have cooled completely, pop them into the freezer until they are frozen, about 20 minutes. WHY? You don’t want your cookies to turn into crumbs or mush when you press the two cookies together sandwiching the ice cream, freezing them provides structure and hardens the chocolate. SOFTEN your ice cream by allowing it to sit on the counter* for about 10 minutes, making sure your cookies will be nice and frozen by the time the ice-cream is soft. *If you are in a hurry, you may zap it in the microwave in 10-15 second intervals until it’s soft enough to scoop, but not soupy! ICE CREAM! Make sure it’s the highest quality, creamiest ice cream you can easily buy (which might mean going to your local grocery store and buying what’s on sale!). For me that means either Häagen-Dazs® Vanilla Bean or Trader Joe’s® French Vanilla, or make homemade vanilla (recipe coming soon) and you’ll hit it out of the park! Choose your favorite flavor. PREP! Place your [amazon_textlink asin=’B008Y2TST0′ text=’sprinkles’ template=’ProductLink’ store=’thefreshcoo0a-20′ marketplace=’US’ link_id=’77247473-7804-11e8-8d5f-c7ef7ef87853′] into shallow bowl(s) or I like to use a sturdy [amazon_textlink asin=’B00KQ17X6C’ text=’cupcake liner ‘ template=’ProductLink’ store=’thefreshcoo0a-20′ marketplace=’US’ link_id=’aa956ddf-7801-11e8-89de-cbf574827b6a’]to hold the sprinkles, once you finish rolling them in sprinkles, just toss the cupcake liners. Place all of your supplies all on a cookie sheet with your [amazon_textlink asin=’B0002U34EW’ text=’ice cream scoop’ template=’ProductLink’ store=’thefreshcoo0a-20′ marketplace=’US’ link_id=’ad6d01c9-7802-11e8-8ee1-f17fa1e5ffbb’], even scooping a couple of scoops and keeping them in the ice cream carton, ready to go. ASSEMBLE | Place a generous scoop of ice cream on the bottom of your cookie, match it up with a similar sized cookie, press down gently, squeezing the ice cream just to the edges. If too soft, just scrape off the excess that squeezes out before rolling in sprinkles. Carefully roll ice cream edges in sprinkles. Set on cookie sheet and working quickly repeat the process. FREEZE | If doing more than 4 at a time, take them to the freezer in batches of 4, so they don’t melt. Freeze for 20 minutes and then wrap tightly in plastic wrap, store in the freezer. 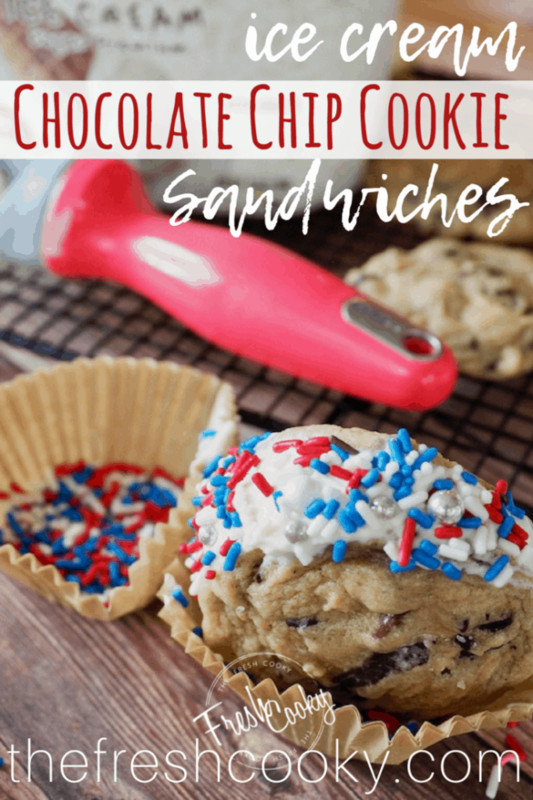 To make these extra decadent and festive, dip one half of the sandwich in melted chocolate (follow the instructions on your package of Ghirardelli Melting Chocolate or Chocolate Chips), then dip again in sprinkles or crushed nuts. Try different sprinkles, jimmies, confetti, mini chocolate chips and even mini M & M’s (careful though, their color tends to run). Try different ice cream flavors, vanilla is my favorite, but use your favorite! DID YOU MAKE THIS RECIPE? I’d love to hear how it turned out, leave a comment below and share a picture of it on Instagram with the hashtag #thefreshcooky. © 2018 | This recipe for Chocolate Chip Cookie Ice Cream Sandwiches was featured first on The Fresh Cooky. If you try this recipe, be sure to tag @thefreshcooky on Instagram and hashtag #thefreshcooky. Note: This page may contain affiliate links. I participate in the Amazon Services LLC Associates Program, an affiliate advertising program designed to provide a means for me to earn fees by linking to Amazon.com. If you purchase one or more of the products after clicking one of my links, I receive a small commission (the price you pay is not affected). 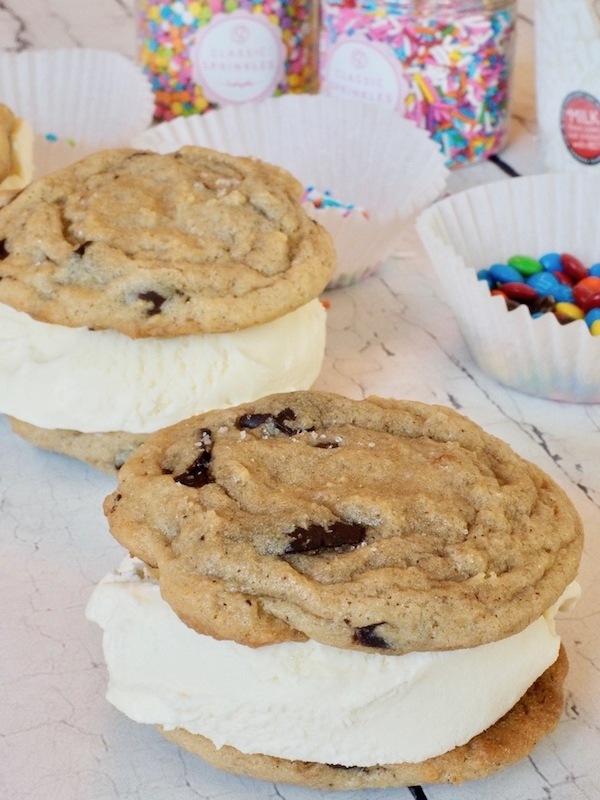 RECOMMENDED FOR CHOCOLATE CHIP COOKIE ICE CREAM SANDWICHES!